SAN ANTONIO - An off-duty sheriff’s deputy has died and two other people hurt when two vehicles plunged into a water-filled sinkhole in San Antonio, Texas, officials said Monday. The Bexar County Sheriff’s Office on Monday identified the victim as 69-year-old Deputy Dora Linda Nishihara, who was a courthouse bailiff who had been with the agency for seven years. 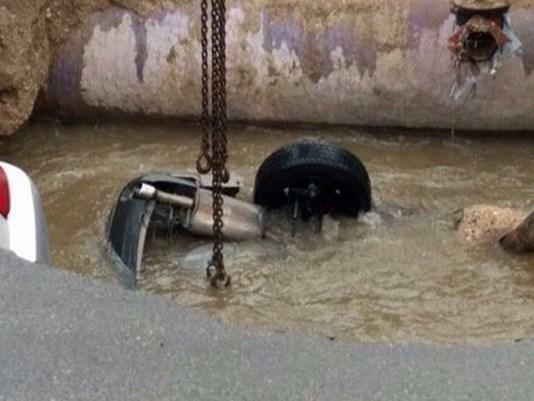 A crane was used to retrieve her personal car from water about 12-feet deep. Nishihara’s body was inside the vehicle. Sheriff’s spokesman James Keith says Nishihara was not working Sunday when her vehicle went into the sinkhole. Utility officials say the sinkhole appeared after a sewer line ruptured during heavy rain earlier Sunday. CBS San Antonio affiliate KENS-TV reports that occupants of a car passing by saw a man stranded in the sinkhole and stopped to help him. Firefighters said in the process of helping him, a woman was injured. By the time first responders were able to make it to the scene, they realized that Nishihara’s vehicle was already 90 percent submerged in the waters, and it was not likely that she would have survived. A 100-ton crane was taken to the scene to remove both vehicles from the sinkhole Monday afternoon.